Well, it looks like I have enough info to put together a couple more pages. Some rather interesting Items will be listed on this page. 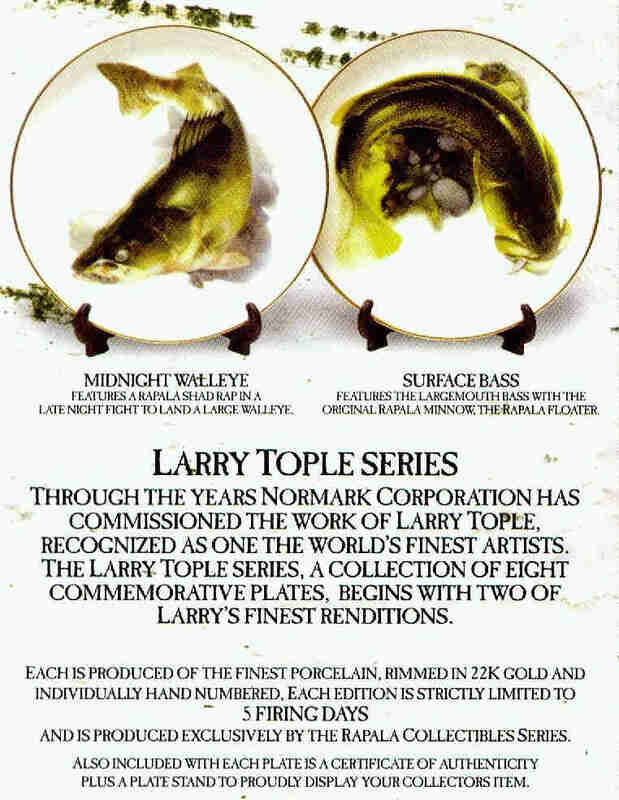 Rapala 1996 catalog.View cover here. Husky: 1 size and 6 colors. Fat Rap deep: 2 sizes and 7 colors. Mini Fat Rap: 1 size and 7 colors. Jigging: 6 sizes and 7 colors. Minnow Spoon: 4 sizes, 2 models and 7 colors. Rattlin Rap: 4 sizes and 9 colors. Down Deep Rattlin Fat Rap: 2 sizes and 8 colors. Magnums: 10 sizes and 6 colors. Husky Jerk: 2 sizes and 8 colors. 2 new size's, the HJ12 and HJ14 added to the Husky Jerk series. The RMS5 is added to the Minnow Spoon series. Tennessee Shad finish (TSD) is new to the Rattlin Rap. Silver blue finish available on Shad Raps, Shad Rap shallow, Mini Fat Rap, Fat Rap and Husky series. When I first got these, or better yet. When I learned that these were going to be in a package of material I was getting. I Didn't quite understand what I was getting. These 3 postcards are in very good shape. All 3 are unused and have great graphics. 1. Shows a tarpon.View here. 2. Shows a rapala lure laying next to a live minnow.View here. 3. Shows a leaping northern pike.View here. All are dated made in Finland, 1981. I was able to pick up a Rapala Counter-mat. It is of the Rapala Shad Rap. 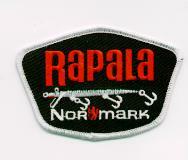 A Rapala cloth patch. It is in mint condition. Just another interesting Item added to my collection. Another promo Item. A Rapala Keychain. Watch out, The colors on this pic will grab ya. 2-8" plates, rimmed in 22k gold. Each plate signed and numbered. Yea, we've all seem them in our favorite magazines. A few years ago I was able to get a few rapala ad's. all of these are made on heavy white stock paper and yes, they are Original. "never be the guy who forgets the rapalas. "View it! "At fine tackle and pawn shops everywhere. "how to (pause) use the suspending (pause) husky jerk etc"
4. 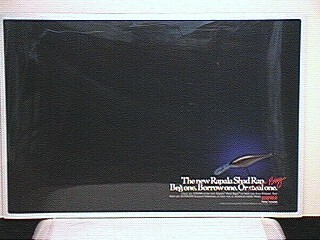 Rattlin Fat Rap ad. View it. "It's bright, it's attractive. You wish you'd married it." "Ranko Dalliinen, Rapala eye painter since 1954View it!! "Oh my. Someone let the floating rapalas spawn with the sinking ones. "View it!! "Deep, deep down. Are you afraid of what lurks in the depths. "View it!! "Now with a sound like that makes fish get up and dance." "Hawgs. The other white meat." "The cat who lived in the woodpile where Lauri Rapala cleaned fish. "View it!! The next page describes some of the Rapala lures I have in my collection.